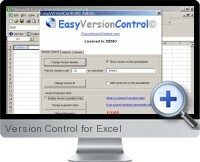 Version Control for Excel is an Excel spreadsheet with advanced version control features in order to audit, manage and track changes to Excel related development projects. The version counter can be displayed in any cell in the versioned workbook. A unique version ID tag is attached to each workbook version. A version expiration date disables editing in the workbook in order to prevent users from editing and submitting older versions. Pop-up calendar provides easy date input. Easy to use administration control screen with password protection. No installations of programs or Excel add-Ins is required. Supports multiple worksheets and hidden sheets within a workbook.